An electric tricycle is perfect for the person who would love to ride but is not quite up to a conventional bike, or trike, You can sit back and let the trike do the work or pedal when you want some exercise. It's sort of the best of both worlds. Some adult communities only allow golf cars which can be expensive to maintain and hard to store. But electric trikes offer an alternative, are a lot more fun, and there are few, if any, restrictions on where you can ride. So if you want to ride to a convenience store, or coffee shop, no problem. You can usually take it wherever you want which you can't do with a golf car. It's baffling to me why most bicycle shops don't carry tricycles of any kind. There is obviously a demand that is growing every day so why don't they carry them? They use basically the same components as a bicycle so repair is not an issue. They may be a bit more prominent in areas of the country with a high concentration of retirees but, in general, availability is much better online. Step through design for easy mount and dismount. Travel up to 30 miles on a single charge. 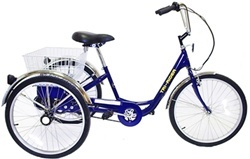 If storage space is an issue you may want to consider a folding tricycle. A folding electric tricycle adds storage convenience to a pedal optional ride for seniors. One of the issues with a standard electric trike is that they are rather large for storing and transport. A trike that folds, and is electric, addresses this issue.